"See The Most Common Mistakes Men Make In Day Game And How An Expert Coach Fixes These Mistakes"
Lots and lots of infield footage broken down and critiqued so you can see what guys are doing right and wrong. The students each have different strengths and weaknesses, so it's likely you'll be able to identify with at least one of them. Great bonus product included. No variety in locations, as all of the interactions take place on the street. Students sharing one microphone in critique sessions means you miss some of what they say. At times the students are confused about what to do - would have benefited from having a more systematic plan in places. 90% of the content in this program is infield footage of students who are part of a 7-day residential bootcamp. You'll see them approaching women on the streets of London and then watch on as Yad breaks these interactions down and gives his feedback. All of the students already have some familiarity with the model Yad teaches, and there's not much time spent explaining it here. If you'd like a more comprehensive explanation of that then you should check out Daygame Blueprint, which is more focused on theory while this is primarily the practical application of it. If you want to see real world evidence of average guys approaching women on the street and getting positive reactions, this is worth checking out. If you want to see how to put Yad's model of meeting and attracting women into action, it's also worth checking out. If you're already at an advanced level, chances are you'll find this too basic for your needs. 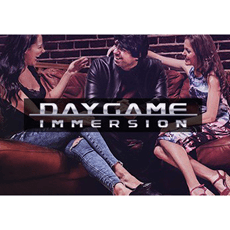 Daygame Immersion is a product that was filmed during a residential bootcamp. If you haven't heard this term before, it's where students live in the same residence as the dating coach for the duration of the bootcamp. In this case there are six students who are being taught day game by Yad and Andy Moore. They're all staying in an upmarket area of London and going out for an entire week talking to girls on the street in various parts of the city. All of this is filmed by hidden camera, after which the footage is played back during a critiquing session where Yad analyzes what each guy is doing right and wrong. The first thing you should know is there is a lot of content included here. The course is broken up into Day 1 through to Day 7, with each day having an introduction video and lecture from Yad, critique session from each of the students, and then a debriefing session with Andy. There's over five hours of video on Day 1 alone. The way that Andy suggests you use the product to get the best results, is to watch the videos for each day and then go out and apply what you learn in the real world. Go out and talk to some women and practice the different things Yad teaches before moving on to the next day's videos. This is good advice, as you'll otherwise get overwhelmed by trying to consume all of the content here in one go. Two of the students are English, three are European and one is from America. So there's good diversity here and they all have their own strengths and weaknesses and you should be able to identify with some of the sticking points that are on display here. Another thing to note is during the initial introductions when they talk about their previous experience and their goals, some of the students over-estimate how advanced they are. The areas they think they need to work on are at a higher level than the more basic problems holding them back. This is a good lesson to be objective about where you're currently at and to put your ego aside. There's one student who's been studying dating advice for 10 years who thinks he's more advanced, but he's making a lot of basic errors. The rule is that how advanced you are is dictated by your results, not how long you've been learning. The main concept here is you can't move to the next level until you've nailed the one before it. For example, you can't attract a woman if you can't be social and have a conversation with her. And you can't have a conversation with her if you can't get past the fear of talking to her in the first place. This is a good general model to follow to make sure you stay on track and only spend time on the things that will make an impact for you right now. So there's no point in learning tips on seduction techniques if you're still in the fear stage and not meeting any women. This is why you should only move on to the next part of the program once you're competent with the current one. It's important to point out that the theory of the model is not explained in as much depth as Yad and Andy's introductory program, Daygame Blueprint. That program was recorded at a weekend seminar and goes really in-depth to a lot of the principles that are taught. As such, both of these programs complement each other really well and having both will give you a more rounded understanding of day game. One thing you'll find here is some aspects aren't explained in the lecture portion and you'll have to learn from watching the infield clips. For example, Yad has a particular way of stopping women on the street and beginning a conversation with them. This method is not explained to the viewer, but you'll see the students use it nearly every time so that's how you'll learn it. It's more or less assumed people watching this program will already be up to speed on the theory side of things. On Day 4 there's a nice addition here as Ollie, a professional image consultant, gives a presentation and spends some time critiquing the fashion of each of the students. He clearly knows what he's talking about and Andy worked with him previously to dramatically improve his own fashion sense, with great results. His goal is on creating more of a high-end look and making sure each of the students dress appropriately for their age. Most of the guys here were in their 30's and wearing clothes more suited for a younger guy, and Ollie explains what women are likely to think as a first impression when they see this. The focus is mainly on street-fashion for London, but the ideas here will be applicable in most places. It would've been great to see clips inside the shops where Ollie points out different items that will suit the students, however this isn't included here. What you do see is how each of them are dressed differently after their shopping session and how women generally react better to them from this point onwards. The majority of the infield footage shows interactions right from the beginning through to about five or ten minutes. So what you're going to see again and again is the initial approach and students trying to maintain the conversation while creating attraction. This happens with varying degrees of success. Besides the initial opening line, there's no set thing in place for them to say. There's a structure of what to say, but the specifics will vary each time depending on the girl they're talking to. This is where the students all come unstuck at times, as you can see them racking their brains looking for something to say. Essentially, the method calls for them to look for opportunities to tease the girl and banter with her early on, which sometimes they're unable to do effectively. What they'll often do is backtrack in the conversation to something else they talked about before because they can't come up with anything to say spontaneously. In the critique sessions Yad points out much of what they're doing wrong and tries to give examples of things they could've said, often asking the student, "No, why didn't you say (Yad's example) instead of what you said?" The problem with this is Yad has a wealth of experience, so can naturally come up with better things to say. It's not reasonable to expect the students are each going to come up with the same thought Yad would have had in that situation, as they have nowhere near the experience he does. In hindsight they can see what Yad might've done, but there in the moment they often struggle. There's a good exercise Yad recommends which you can do from home to help prepare you for this situation. This is a new idea I haven't come across before so it gets point for originality. However it's just a tool to help, and the most important thing is to get out there and talk to lots of women to build up your experience. It would've been helpful for some of these guys to have a better idea of specific things they could've said in the early stages. In the cases where women respond positively and start asking the guy questions, they're often fine and can develop the conversation further. It's the times when the woman doesn't give them anything to work with that they start to panic and the whole thing becomes awkward quite quickly. Having some default things to do in such situations would've helped this problem tremendously. You'll see all kinds of results here, such as women who clearly aren't interested, some who are but the student blows it, a bunch of phone numbers and a few instant-dates. The guys consistently getting dates are the ones who came in already at a higher level than the guys who just get numbers. What you'll see is that in a majority of cases women are friendly and open to talking to guys when you approach them. There were many instances here where these students could have got much better results if they had more experience and better conversational skills, all things that will come with practice. And a couple of the guys were going on multiple dates some days where the girls were clearly interested in them, sometimes within minutes of meeting them, so for beginners who think these sorts of results aren't possible, this will be an eye-opener for you. From what I could tell there are no results where the students end up sleeping with any of the women they met, and there is no footage of any of them kissing a girl. It's impossible to say what may have happened later off camera though, but there wasn't a strong sexual vibe to most of these interactions. One of the students did try and kiss a girl in a sneaky way and the whole thing really creeped her out, and Yad should've really pointed out how that sort of thing is something to definitely avoid. Similarly, there are times when some of the weaker students are acting needy, such as one guy practically begging a girl to get a hug from her. It just sets up such a bad frame that you don't ever want to get into, and there could've been more feedback given on some of these negative points to really make it clear why these things are bad. There's no footage of Yad talking to women himself in Daygame Immersion, however you do get access to the Yad Show so you can see the man himself in action. There's a total of 15 infield videos of Yad approaching women during the day, broken up into six regular episodes and nine advanced episodes. You'll have free access to the Yad Show for 60 days when you purchase Daygame Immersion. If you wish to keep your access after those 60 days are up you'll be charged $47 a month until you cancel your subscription. So you have plenty of time to check it out and make up your own mind on how good it is, and of course you can cancel at any time within those 60 days and you won't be charged anything. For each regular episode you can watch the raw footage, while for the advanced episodes there's raw footage as well as one with commentary where Yad is joined by Jon Matrix or Tom Torero to break down everything that's happening. There's a lot of really great content here as you get to see extended interactions with hot women and exactly what Yad does to build attraction. This is a pretty valuable bonus, and is certainly of a higher quality than most bonus products that are usually offered in other products.